MJM Shower Chair with Soft Seat Deluxe Dual Usage and Removable Center Section provides users with a convenient dual function as both a shower chair, as well as a commode chair. This is achieved with the simple removal of the center section of the seat. 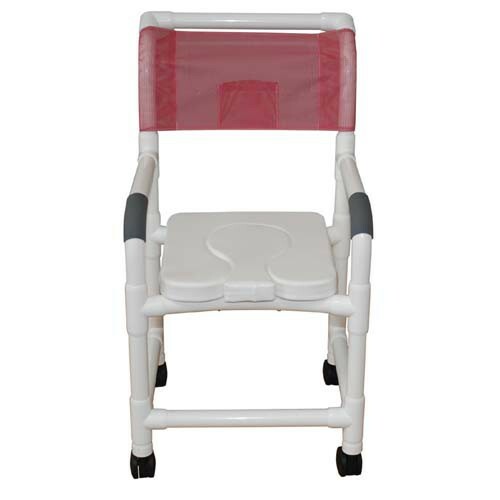 The soft seat combined with the mesh back makes the shower chair incredibly comfortable and ideal for extended use in the shower or elsewhere as needed. The PVC frame and mesh back make it easy to wipe clean after use and help prevent the growth of harmful bacteria. The chair also contains no lead or latex making it safe for users with allergies to these materials. MJM 118-3-SSDD Shower Chair is the ultimate in bathroom safety equipment with non slip hand grips to prevent falls during transfer. MJM also has reinforced the stress points of the chair for more secure stability when in use. This allows the chair to have a weight capacity of three hundred pounds. To facilitate transfers and increase mobility, the chair includes 4 caster wheels, making it easy to move from any room to the shower area. This is also simplified by the handle on the back of the chair, making it easy to push and pull the chair around as needed.